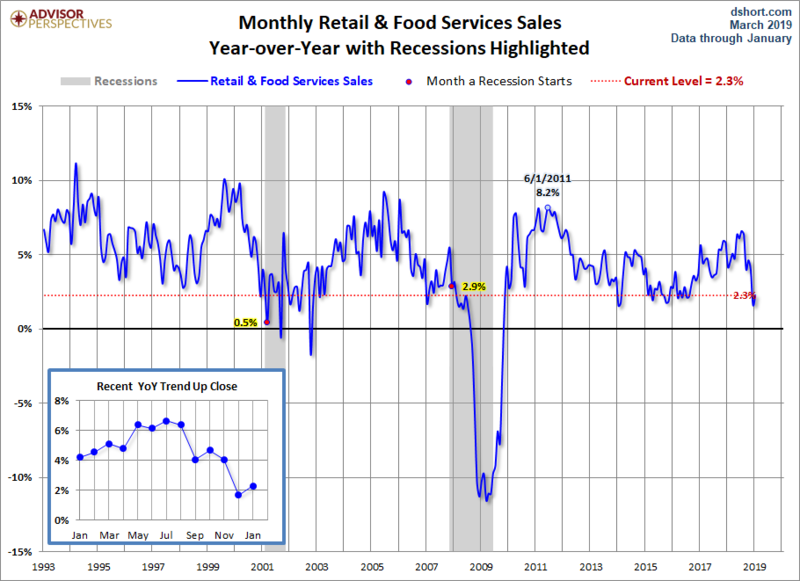 The Census Bureau's Advance Retail Sales Report for January was released Monday morning. Headline sales came in at 0.2% month-over-month to one decimal and was better than the Investing.com forecast of 0.0%.Core sales (ex Autos) came in at 0.90% MoM (to two decimals). 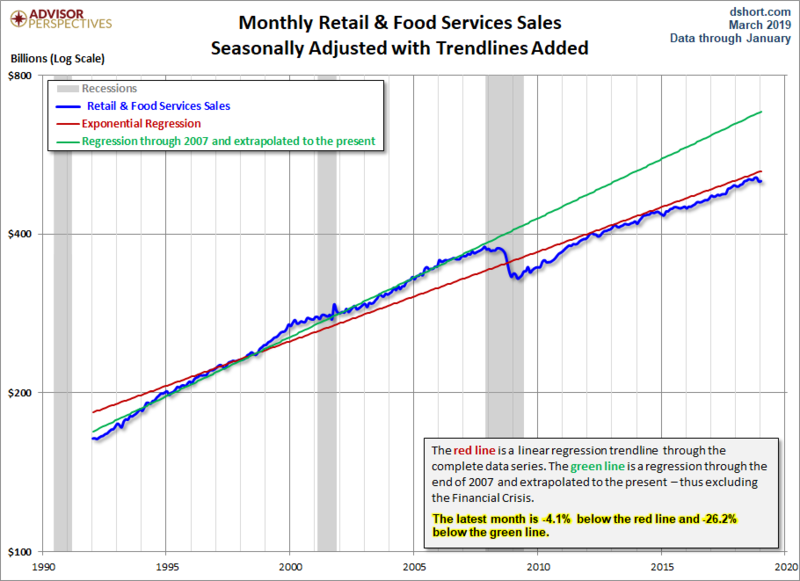 Advance estimates of U.S. retail and food services sales for January 2019, adjusted for seasonal variation and holiday and trading-day differences, but not for price changes, were $504.4 billion, an increase of 0.2 percent (±0.5 percent)* from the previous month, and 2.3 percent (±0.7 percent) above January 2018. Total sales for the November 2018 through January 2019 period were up 2.6 percent (±0.5 percent) from the same period a year ago. The November 2018 to December 2018 percent change was revised from down 1.2 percent (±0.5 percent) to down 1.6 percent (±0.3 percent). 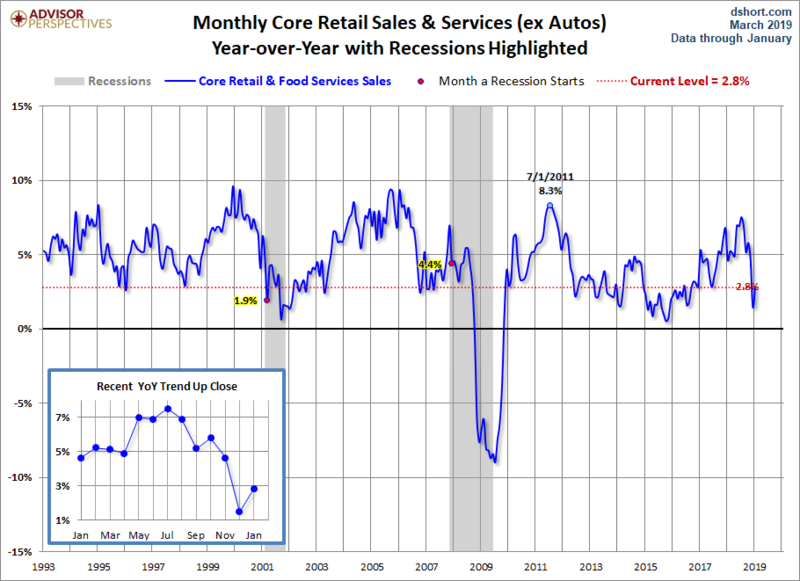 The next two charts illustrate retail sales "Control" purchases, which is an even more "Core" view of retail sales. This series excludes Motor Vehicles & Parts, Gasoline, Building Materials as well as Food Services & Drinking Places. The popular financial press typically ignores this series, but it a more consistent and reliable reading of the economy.